Purenity Comfort Folding Military Bed is an easy to use camping cot with a bonus mat, a pillow, a storage bag, and a great price tag. Purenity Comfort Folding Military Bed. The cot is currently available on Amazon. This link will redirect you to your local Amazon store so you may save on shipping. This cot should not be mixed with yet another presented here in the site under the name Purenity Folding Military Bed which is indeed a construction described as a military-type but collapsible cot. The cot which you have here also has the word ‘military’ in the name, but this is a folding cot. I am using the name as it is provided by the manufacturer. Being a folding cot, it is practically without any assembly, just unfold and it is ready in a couple of seconds. I have included it in my list of best folding cots. But this design also implies a relatively large packed size, it remains large in two dimensions, and this is different from collapsible military-style cots that remain large only in one dimension. So the packed size here is 36 x 27 x 6 inches (91 x 69 x 15 cm). 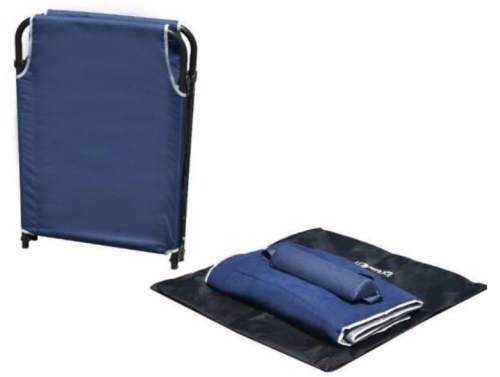 The picture below shows the cot folded and the included elements: the mat, the pillow, and the carry bag. All the elements: the bed, the mat, the pillow, and the carry bag. Size-wise, this is a relatively small cot. So the bed size is 72 x 24 inches (183 x 61 cm) and if you are a tall person better check elsewhere. 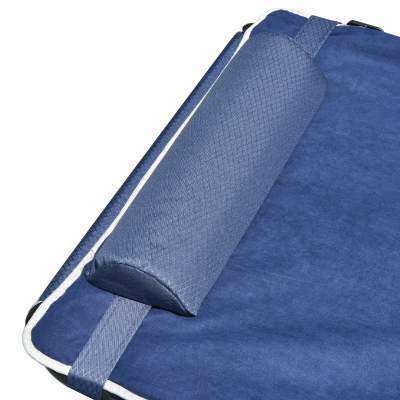 In this list of padded cots for camping, you will see several exceptionally long and wide cots. 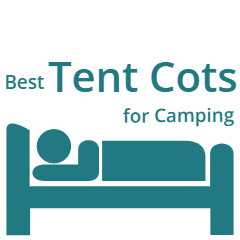 Also, if you need something much wider, please check this list of extra wide camping cots. Capacity-wise, this cot can support the weight of up to 260 lb (118 kg). So this is quite a modest value but this is fine if you are not particularly heavy. Otherwise, please check my list with cots for heavy people. 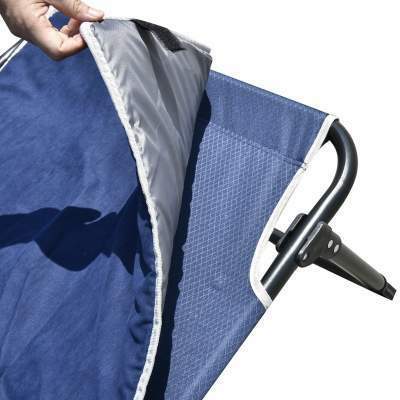 Weight-wise, you have a cot that weighs 11 lb (5 kg) which is more than what you have in the Magshion folding cot. But in view of the mentioned packed size this is not so important because it is not built to be carried long distances. Though you can do this, the carry bag has a shoulder strap. Note that the cot is quite high, 18 inches (46 cm), so it may be useful for elderly users. You will need a car to transport it for your outdoor activities. 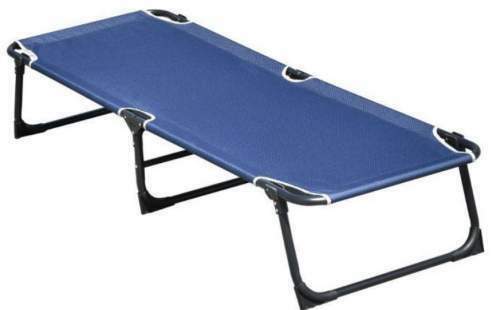 You can also use it as a spare bed at home for emergency situations and for sudden guests. This Purenity Camping Cot is an aluminum construction with rubber caps on its bars. So this is a floor-friendly design and the three bars offer a really good stability. The bars distribute the weight and the cot will not sink considerably on any surface. The bed deck is a coated canvas and it is preattached to the frame. The picture below shows it without the mat. This is the cot shown without the mat. Note that there are no bars anywhere close underneath the bed deck, just the frame is everywhere around. The mat: The cot comes with a mat which is detachable and you can wash it. It covers all metal parts and you fix it with Velcro tabs to the frame. The pillow: The pillow is included, it is rather small but you might manage without anything extra. There is a strap that keeps it attached to the bed. Carrying bag: It is rare to have such a folding cot with a carry bag, so this is a great bonus here. It is with a shoulder strap so you can carry it shorter distances, and it will be good to use it to store the cot at home and keep it clean from dust. I already mentioned the feet, so you can use it without issues even in a floored family camping tent. With such a clearance under the bed, you will have plenty of space to store your gear. The mat offers a bit of insulation and cushion, so this should be fine for up to 2-season use. In a cooler environment, you might need more insulation. But you will always need less when you sleep on the cot as compared to sleeping on the floor. 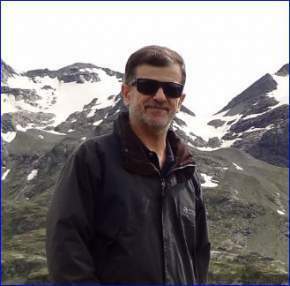 Weight: 11 lb (5 kg). Capacity: 260 lb (118 kg). Dimensions (L x W x H): 72 x 24 x 18 in (183 x 61 x 46 cm). Packed size: 36 x 27 x 6 in (91 x 69 x 15 cm). I have decided to show you how this Purenity cot compares with some of its competitors. So I choose the Magshion cot because it is very similar in style, and also the Chinook cot which is also folding but padded and it is much bigger. Now you can get some idea of what to expect. As you see, regarding the weight, the Purenity cot is in between. Its capacity is far lower, and the size is similar to the Magshion cot. Both these cots are rather short but they are very affordable, check the Chinook if you are a tall person. So to summarize this Purenity Comfort Folding Military Bed review, this is a very easy to use folding cot, the price is simply excellent, and it comes with very useful bonuses. But bear in mind the bed size if you are a tall person. If the mat which you have here is not thick enough, please check my list of cots with mattresses. You might want also to check this Eltow Portable Folding Camping Cot built in the same style but also reclining. Note that this is not a sponsored text and I am not paid by the manufacturer. Thank you for reading. Please use the comment box below in the case of questions or comments.